Today games are not viewed only as a child’s venture; there are very many adults who enjoy the challenges that are presented by most games. There are several games in the market today but one of the most popular games is the Minecraft game. Minecraft is loved by many, mostly because of its uniqueness; having to build your own world instead of playing in a world that has already been set out for you. The little but very important modifications make the game more interesting. Zan’s minimap which is also known as Voxelmap, is one such modification that adds an interesting feature to this game. This is however recommended for the Minecraft version: 1.11.2, 1.11,1.10.2,1.8,1.7.10, 1.7.2 and 1.6.4/1.5.2. What makes this mod outstanding is the fact that it enables the player to know exactly where they have been and where they are heading to. This Voxelmap or the Zan’s minimap has several similarities to the Rei’s minimap, but with more customization options. This minimap mod has support for Aliens motion Tracker and retro Sun direction mod. It also supports square shaped minimaps and offers more texture packs. Other than a Radar mod for multiplayer, it also supports several languages; making it truly one of a kind. This mod is a great add on to your Minecraft game especially with the graphical menu that allows you to modify the map details and an advanced height indicator for mobs. The indicator for mobs shows you the locations of the enemies that are near you, helping you avoid colliding with them when you least expect it. When you play depending completely on your luck, then things get a little technical. Voxelmap offers a death maker that shows your exact death location; it’s easier to successfully advance to different levels with this particular feature. Pressing “B” will let you add a waypoint to the map, which has many uses, can be used to find certain things, to mark points of interests on your map and much more. “Z” will zoom the minimap, cycling through the various levels of zoom. To open the full map, simply press “X”, and unlike the crafted map, this shows places you haven’t explored yet. There is also an unbound key that toggles mobs, simply bind the key you want to it to toggle if you want to see mobs on the map or not. Remove all other keybinds set to M, zan’s seems to take last priority. Just go to options > controls > all and find ANYTHING that’s on M and change it. 1. The installation procedure for Voxelmap varies depending on the version of your minecraft. 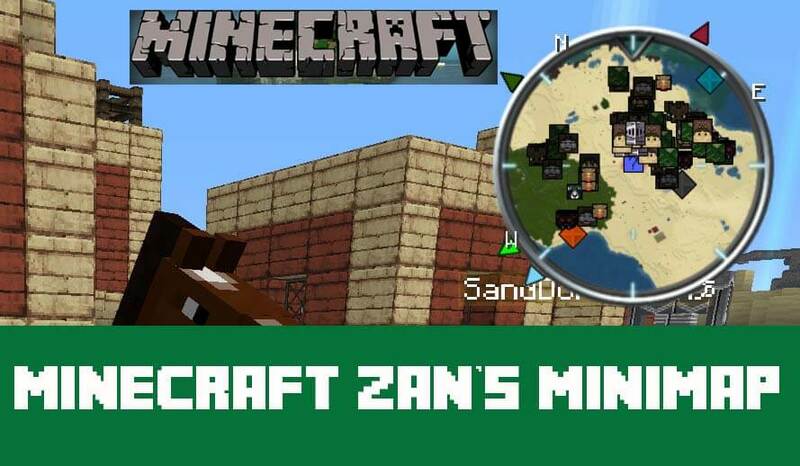 The Zan’s minimap installation procedure for the version 1.7.2 starts with downloading the Modloader before downloading the Zan’s minimap. 2. All you have to do is go to the start menu and type – %appdata%/.minecraft/bin and press enter. Using the WinRAR, 7zip or any other archive software; open the Minecraft.jar then proceed to opening Voxelmap zip file. Drag and drop the Voxelmap files and folders into the jar. 3. Another important action that assists to avoid black-screen issues is to delete META-INF folder. 4. Finally launch the Minecraft, check if the mod is installed properly then back up your minecraft.jar. Graphical Menu for modifying map details. Download Litloader 1.7.10 and run its installer. Then get the Voxelmap mod file from link above. After that go to /.minecraft/mods folder and put the litemod file there. Finally, launch Minecraft using Liteloader profile. i just want it for forge!!! its not working for me. i have liteloader linked with forge and i extract the files to the mods folder in the minecraft. folder and it doesnt pick it up at all. other mods from the same mods folder work perfectly. what am i doing wrong? It crashes when i start the game on litemod version. yeah liteloader doesnt work for me on 1.8. It crashes as soon as I try to load the game. Tried both ways of using liteloader. it crashes the same. this would be a lot better if it were made for forge. Okay, so I have installed this mod many many times, whenever I load up my 1.7.10 minecraft, I look at the option labeled: Mods, I do not see Zan’s Minimap or VoxelMap, I load a world, do not see the map, PLEASE HELP ME!!! Look to the top right side of the Minecraft main page, you’ll see a little tab, click on it, there’s the mod.